At the time of the economic crisis and the fall of the pound, planning skiing-holidays in France would seem totally crazy. And yet, how could we just give up and stay wisely and boringly in London whereas the weather is absolutely perfect for skiing down slopes? France in London helps you finding some good deals. You just have to wax your skis! 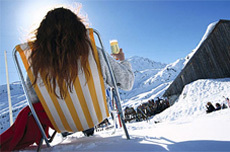 Some French skiing resorts from the Alps, Pyrenees, Vosges or Jura are offering great offers. Is there anything that seduces you? Find out more on www.skifrance.fr. Find out more about French skiing resorts. Fancy a short skiing escapade? Two or three days in the mountains, skiing, relaxing, breathing some fresh air is the perfect way of dismissing from your mind what is stressing or unpleasant. Don’t you agree? Moreover it’s not necessarily out of your budget! Until 2 February you can enjoy accommodation from 15 euros a night per person, plus 50 euro-reduction on every ski-pass in Les Arcs or Paradiski! For getting more information or booking, contact them by phone: 00334 79 07 68 00, by fax: 00334 79 07 68 99 or by e-mail reservation@lesarcs.com. From 192 euros per person you can get accommodation for two nights in a small studio flat, two-day ski-pass at La Forêt Blanche plus 45 minutes of ski-scooter. That sounds fun, doesn't it? For getting more information or booking, contact the tourism agency of Risoul by phone, 00334 92 46 02 60, by fax, 00334 92 46 01 23 or by e-mail info@risoul.com. What about a skiing week-end with friends? From 114,35euros per person you can get accommodation for four people during four nights, ski-pass and a snowshoe-excursion with professionals. For getting more information or booking, contact them by phone, 00334 93 23 24 32, by fax, 00334 93 23 24 37 or by mail resa@valberg.com. Fancy a romantic skiing escapade? Skiing holidays could be so romantic! Just take a look at the Danish Royal couple… It’s never too late for a second honey-moon, and that could be a good gift idea for Valentine's day. 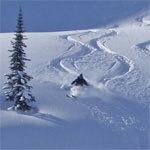 Seven nights in a two stars bed and breakfast and six-day ski-pass for two, from only 507euros. What else? For getting more information or booking, contact the tourism agency of Megève by phone, 00334 50 21 57 24, by fax, 00334 50 93 03 09 or by e-mail charlotte.townend@megeve.com. Seven nights in a mini studio with all the equipments near the resort, a ski-pass in La Forêt Blanche, a 45 minutes snow-scooter escapade, a snowshoe excursion, a massage… How could you not be happy? From 354 euros per person. Skiing holidays with friends are always a good time. From snowball fighting to ski racing, raclette parties to hot wine tasting, brilliant falls to sledging… good memories are simply guaranteed! 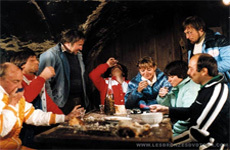 Don't you have seen Patrice Leconte's film "Les Bronzés font du ski"? "Les Bronzés font du ski"
Accommodation in a furnished apartment and ski-pass for the two resorts… from only 118 euros per person! Pack your bag! For getting more information or booking, contact the tourism agency of -Margeriaz by phone, 00334 79 54 63 65, by fax, 00334 79 54 61 11 or by e-mail infos@lesaillons.com. A three stars accommodation for four people with a swimming-pool plus a six-day ski pass in Méribel’s valley, 306 euros. For getting more information or booking, contact the tourism agency of Brides les Bains by phone 00334 79 55 20 64, by fax, 00334 79 55 20 40, by e-mail contact@brideski.com. At two luxurious chalets, Chalet Flegère and Prairie des Fleurs, we are able to offer substantial discounts for the rest of the season, excluding the week commencing 14th February. There is a discount of 35% off both the VIP and Freedom to Choose weekly packages as shown on our website. Alternatively, there is now a self-catering option at both these chalets, which will include maid service twice a week and the in-resort concierge service. The weekly price for Chalet Flegère (sleeping 10) is £4200.00 per week, and for Prairie des Fleurs (sleeping 14), it is £4800.00 per week. 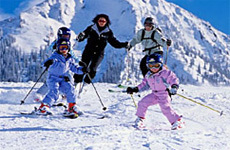 Fancy skiing with your family? You love skiing but now that you’ve got a big family you don’t feel like going anymore. Too expensive, too complicated with the children... It’s true that skiing family holidays could be a nightmare but some resorts have planned everything to make it absolutely perfect for everyone! Don’t deprive yourself! Here are some ideas. From 4 April in Morzine, accommodation and ski-pass are free for children up to 12 years old if their parents purchased both for at least two days. Interesting, isn’t it? From 437,70 euros for the whole family (parents plus one child between 18 months and 3 years old). Monts Jura's resort has planned everything to make your week perfect: Accommodation in a studio apartment, ski-pass for both parents for 4 days and 5 half-days in a children-club for the baby. … So… Why are you still here? Just pack your bag and enjoy skiing!